The conference schedule is available using the Guidebook app. http://guidebook.com/g/20th-CIFOR-Yaounde/. Once you have downloaded the Guidebook app, click ‘Download Guide’, and search for ‘20th-CIFOR-Yaounde’. If you have any questions or require technical support for the app, please contact CIFOR-Multimedia@cgiar.org. Central Africa is home to the second largest continuous block of rainforest on the planet after the Amazon Basin. The area hosts a wealth of biodiversity and provides vital regional and global ecological services. Although attention to forest issues in the region has increased since the Rio Summit in 1992, there is still much to be done to address the new threats facing these important forests and the challenge of managing them sustainably. As part of its 20th anniversary celebrations, CIFOR organized with its partners a two-day policy and science conference entitled "Sustainable forest management in Central Africa: Yesterday, today and tomorrow." Bringing together the region's leading policy makers, donors, media, researchers and forest experts, the conference provided a forum for open discussion of the most critical issues and challenges facing the sustainable management of Central Africa's forests, the biodiversity they embrace and the people who depend on them. 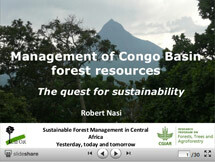 The conference was hosted by the Minister of Forestry and Wildlife of Cameroon, who opened and closed the event. Over 520 guests attended the first day and more than 350 on the second day, and nearly 25 high-level speakers presented topics. Check back soon to see interviews, slide presentations, photos, videos and more.